vi, 165 leaves : ill. ; 28 cm. Thesis (Ph. 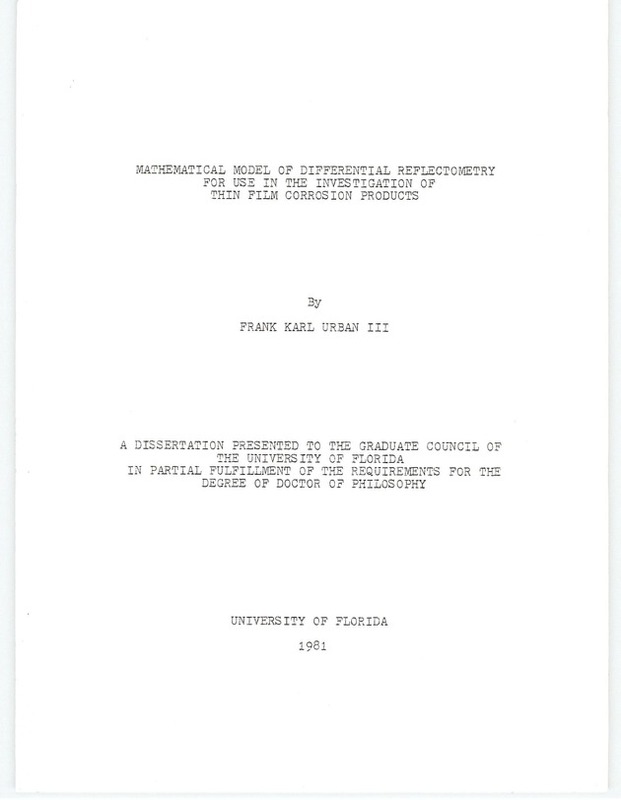 D.)--University of Florida, 1981.
by Frank Karl Urban III. for high ideals. Thanks especially to Dr. IE. D. Verink, Jr.
above the call of duty. Dr. J. R. Ambrose, Dr. P. H.
z performance of this work. light with thin corrosion product films on metal substrates was developed. This model is different from previous models because it is based on Maxwell's equations only, utilizing no simplifying assumptions. expected. The peaks obtained experimentally for these thin films are therefore caused by electron interband transitions. They can be used to identify specific metal oxides on metal substrates. calculated differential reflectograms with experimental reflectograms of a number of oxides of various thicknesses grown on metal substrates by heating in dry oxygen. Specimens were prepared as follows. The oxide on half of the specimen surface was removed by mechanical polishing. The other half of the specimen was unaltered. The resulting reflectograms provide information based on the difference in reflectance between pure metal and corrosion product on metal substrates. High purity tungsten was chosen for the primary experimental thrust. Chromium, molybdenum, zinc, magnesium and copper also were investigated. Matching the calculated and experimental reflectograms leads to the identification of the source of each peak, the establishment of the interband peak energies and the determination of optical constants and thicknesses of the film. The Differential Reflectometer is becoming an important surface analytical instrument comparable with x-ray or Auger analytical techniques. One of the most serious materials problems today is corrosion. Corrosion costs over eighty billion dollars annually in the United States alone. 1 Corrosion is consuming capital investments including buildings, roads, vehicles and machinery. Costly mineral, energy and human resources are used up to replace the losses. Clearly impQrovements in corrosion control are of major importance. To obtain this goal one must have a thorough understanding of corrosion processes. Eight basic forms of corrosion have been identified. 2 ost observed corrosion may be categorized into one or more of these forms. The composition of the corrosion product, its thickness and growth rate are some of the key information needed to understand corrosion mechanisms and facilitate corrosion management. Corrosion of bulk material commonly involves the formation of a thin film of corrosion product on the outside surface. This thin film is a compound of the base material and some substance(s) from the material environment. For example, Al.0 3can form on aluminum exposed to air or oxygen.3, CuO may form on copper and copper alloys exposed to air-(. The qualities of the film have a strong influence on the further corrosion behavior of the material.5 Some films protect the bulk from further corrosion, for example A12 0 3 protects Al. Other films may not provide protection. The films are initially extremely thin and therefore require special techniques to characterize. film is essential in the understanding of the total corrosion response of the material. Knowledge of film composition allows one to observe changes in composition produced by environmental changes and alloying additions. Computation of film growth rates is made possible by film thickness measurements. Thus thin film characterization is a necessary step in understanding corrosion. A number of techniques are suitable for characterizing thin films. Each has advantages and limitations. There are chemical methods and techniques which probe the electronic structure of the film by sending in energy, particles or electromagnetic waves, and measuring energy absorbed or given off. Both methods probe the first few atomic layers (about 0.3 nanometers) and are truly surface techniques. AES and ESCA both suffer from some limitations. Both employ expensive equipment and require skilled operators. But most important, both require that the sample be placed under vacuum. The vacuum may have an effect on the thin, sometimes delicate corrosion films. Both methods are relatively slow, partly due to the vacuum required. measures the extent to which plane polarized incident light is converted to elliptically polarized reflected light. From one set of measurements, two of the three film parameters (n, k, and d) can be calculated if the third is known. The parameter n is the index of refraction, k is the index of absorption and d is the thickness of the film. By performing additional measurements all three parameters may be calculated.17 In traditional ellipsometry the measurements have to be taken at each desired wavelength. Scanning ellipsometers have overcome this problem. employs a monochromatic beam of light which scans between two samples having slightly different reflectivities (R). The difference in reflectivity between two samples (6R= R 1 R 2 is electronically divided by the average reflectivity ( F= (R 1 + R 2)/2). The A R/ P. is plotted as a function of wavelength of the light to produce the DR spectrum. This differential reflectogram yields peaks at characteristic energies which can be interpreted by using the electronic band structure of the material under investigation, such as a corrosion filmn.8,21,22 Thus Differential Reflectometry provides optical information in a different form than ellipsometry or other transmission and/or reflection techniques. low absorption. In addition the value for k may be obtainable. The primary advantages of Differential Reflectometry are that measurements can be pQerformed in air as well as in an electrolyte, i. e. in situ, and that extremely small differences in refllectivity may be measured allowing the identification ofL very thin corrosion films. Measurements are fast; an entire spectrum is recorded within one to three minutes depending upon the scanning speed selected. Finally the measurements cover a continuous band of light wavelengths ranging for example from 200 to 800 nanometers. In this work a model was developed which takes into account the interactions between the incoming light and an oxide film on a metal substrate. The model relys upon several basic assumptions. Firstly, the validity of the Maxwell equations is assumed. Further the conditi on that the electric and magnetic fields are continuous at a boundary must hold. Finally it is assumed that no substantial error is introduced by describing the corrosion film as having average optical constants and a uniform thickness even though there may be variations in n and k with depth. From these considerations an equation for the reflectivity may be written that relates the electric field of the incident light to the electric field of the reflected light. Two reflection equations were written, one for each of the sample halves, see Figure 1.2. The difference of the two calculated reflectivities was divided by their average to obtain AR/ R. The result was plotted as a function of the wavelength of the light. In this way calculated differential reflectograms were generated. The computations were found to be quite elaborate. Therefore, a digital computer was employed to generate the AR/ R v. s. X( plots. The normalized differential reflectivities of the corrosion products of various metals were also taken experimentally. The metals which were investigated included copper, magnesium, zinc, molybdenum, chromium and tungsten. The specimens were mechanically polished and heated in dry oxygen to obtain the desired corrosion product. Subsequently part of the corrosion product was removed from one half of the specimen as described in subsection 111-4 in order to obtain the step configuration shown in Figures 1.1 and 1.2.
compared with the calculated ones. These studies led to new insights into the general structure of differential reflectograms and how these reflectograms are altered by the thickness of the corrosion films. In section IV the method for determining optical properties and oxide film thicknesses from the experimental curves is discussed. In the development of a line shape analysis of differential reflectograms of metal-oxide corrosion products, it is necessary to consider previous research in two areas, optical computations and studies of the specific corrosion films in question. The line shape analysis leads to the computation of the optical properties of the corrosion film as well as the identification of the composition of the film. Previous research in optical properties which is relevant to this work includes basic optical theory and various computational techniques. Experimental investigations have been performed on bulk as well as thin -film specimens. Previous studies on oxides include thermodynamics, kinetics of formation, crystal structure, transformations, optical and other properties. A review of this work forms a basis for the computer model developed in the next section. interaction of light with matter form the basis of the methods for calculating the optical parameters n and k. Each of the theories enjoys success within certain ranges of applicability. The Drude free electron theory established in 1899 models a metal as containing a "sea" of free electrons which are able to move in response to an applied electric field. As long as only free electrons are involved, the theory describes observed physical phenomena. Lorenz models insulators as containing bound electrons which are attached to their nuclei by electrostatic forces similar to springs. These electrons are assumed to oscillate in response to an applied ac electric field. The Lorenz model (1910) describes the behavior of insulators although the d~c conductivity is not accounted for. A combination of the Drude and Lorenz theories can account for the behavior of most materials over a wide frequency range of the applied electric field. The quantum-mechanical theory considers electrons to exist in energy bands and to respond to externally applied fields by experiencing interband and intraband transitions. This quantum-mechanical band theory of solids appears to encompass observed light-material interactions. optical property measurements have been shown to provide insight into the electronic band structure of a solid. 8 Reflectivity peaks correspond to interband transition energies and serve as an experimental test of band calculations. With established band diagrams, the peaks may be used to identify an unknown material. optical measurements is ellipsometry.2 Ellipsometry measures the extent to which plane polarized light, incident on a material at an angle cc is converted upon reflection to elliptically polarized reflected light. The elliptically polarized light may be viewed as a superposition of two normal plane polarized rays with an amplitude ratio Y- and phase difference A~ The values of n and k are calculated f rom Y and A.
considerable error may be introduced because the reflectivity is not measured over all frequencies and instead extrapolations must be substituted. Another approach is to use an iterative computer program such as the "NOTS Multilayer Film Program"'. 10This program calculates reflection and transmission values from assumed n and k values. The program automatically increments n and k until the resultant calculated reflection and transmission values most closely agree with the experimental values. A different approach is required when n and k for thin absorbing films need to be obtained. In a review article, Abeles discusses reflectance, transmittance and ellipsometric techniques which are used to determine n and k for homogenous, isotropic as well as for anisotropic metallic films. The values of n, k and d are varied until y in equation (2-15) reaches a preselected small value. The associated values of n, k and d are then taken to be those of the film. The Heavens equations may be directly used to obtain computer calculated solutions for the optical constants through another method. Reflection and transmission measurements at near-normal incidence allow the calculation of the optical constants as long as an independent measure of the thickness is known. 17,38-41 The computer methods are in general iterative, solving for the values of n and k which produce a close match between the measured and calculated values of reflection and transmission. The optical constants of a thin film deposited on a non-absorbing substrate may be calculated from transmittance using a Kramers-Kronig analysis. 42The equations relate the real and imaginary parts of the transmittance. The real part is the change in amplitude and the imaginary part is the change in phase of the light. Each ellipsometric measurement is taken at a particular light wavelength. Thus, many measurements must be made to obtain the spectral dependence of the optical properties. All the methods previously discussed assume homogeneous, isotropic films which are perfectly flat and are deposited on a flat substrate. The problems introduced by the conditions of non-uniformity, anisotropy, inhomogeneity and surface roughness have been the subject of inquiry by a number of investigators. An early study explains how the apparent color of a glass can be produced by the presence of microscopic particles of metal. 46it has been shown 47 that average values of the optical properties can be used instead of a continuous variation in optical properties. It also has been shown that it is possible to represent a real surface film having a rough surface with an equivalent flat film having a perfectly smooth surface. 48 The notion of an equivalent flat film is further supported by results originating from ellipsometric measurements on absorbing films in which the calculated film thickness was in agreement with two independent thickness measuring techniques. 49This result is particularly important for the development of the model in the following section. A method for ellipsometric measurements and calculations for films containing foreign particles has been developed.5 The foreign material was treated as though it were an equivalent film, in addition to the film in which the particles are located. The equivalent film was assumed to have the same volume as the total volume of the foreign particles. to c computing thin film optical constants with particular attention to multilayer films. He describes graphical and explicit formula methods for obtaining reflection magnitude by keeping track of the E and H fields of the incident and subsequently multiply reflected and transmitted electromagnetic waves. The transmission and reflection factors are found by assuming continuity of the E and H fields at a boundary. He concludes that for the purpose of multilayer film design, the four terminal network model is insufficient in that it cannot account for the polarization and obliqueness of incidence. The oxidation of metals is by no means an untouched field. A complete review of the literature is beyond the scope of this work. An excellent early review is given by McAdam and Geil.53 There are a number of texts in the field including one by Fromhold.54 The following focuses upon three specific areas involving metal oxides. These are optical properties, phase diagrams and electronic structure of the metal oxides of particular interest. Since the primary thrust of this work is in the tungstenoxygen system, most of the previous work in this area is shown here. Other metal-oxygen systems were investigated primarily to support the findings for tungsten oxide. The optical properties of two tungsten oxides, W02 and WO3 have been reported by several authors. 2.3. The average value reported by Deb is in good agreement with the value obtained by Sawada and Danielson. Deb also reported optical absorption, k, of WO3 as shown in Figure 2.4 He reports absorption peaks at 4.39 eV (282 nm) and at 5.25 eV (236 nm) for thin films. These peaks moved to lower energies (longer wavelengths) with increased annealing time. Deb observed that the thin films are commonly amorphous and suggests that this fact may explain the lack of certain absorption peaks predicted by band calculations based upon the assumption of crystalline material. He reported an absorption peak for MoO3 at 2.85 eV (434 nm) for thin films.58'59 The index of refraction of MoO3 is shown in Figure 2.5 as measured by Deb. Chase6o has determined the dielectric constants of Cr02 and Mo02 and these are presented in Figure 2.6 and Figure 2.7.
films as a function of 14Lght wavelength. is reported in the right graph of the figure. CrO2 as a function of photon energy. temperature as measured by ellipsometry. room temperature as measured by ellipsometry. transmission of Zn0 as a function of wavelength from 300 to 900 nanometers, see Figure 2.10. 2.12. Ladeife et al5 present the optical constants of Cu20. These are shown in Table 2.1. A number of phase diagrams of the tungsten-oxygen system have been published.6668 The phase diagram of St. Pierre et al.68 is presented in Figure 2.13. It can be seen that below 484 0C the only phases thermodynamically expected are W30, W02 and WO 3 Between 484 0C and 585 C W20058 becomes thermodynamically stable. Above 585 0C W18049 also becomes stable. 2.14 presents the band diagram of OW 3.69 It can be seen that four symmetry point interband electron transitions are indicated. The P point transition is generally believed not to occur. It has the same energy as the X point transition, 1.9 eV (651 nm). The M point transition is at 4.6 eV (269 nm) and the R point transition is at 6.12 eV (202 nm). Figure 2.10 Optical1 transmission of a ZnO film. The wavelength dependence of n and k for Cu0 films. the Na site along the symmetry axes. sample preparation, corrosion, preparation for measurement and recording the differential reflectogram. high were cut from high purity rods. Table 3.1 lists the sources and purities. One part of the disc was cut away to produce a "D" shaped sample, Figure 3.1. The flat side of the sample serves as a guide for the half polishing technique (see below). Rough polishing was performed using 180, 320 and finally 600 grit silicon carbide paper using soap as a lubricant, followed by Microcut Paper Sheets* to remove the silicon carbide grit from the sample. The samples were then polished on polishing cloth to a 6~4 diamond and finally to a iP. diamond finish using Metadi Fluid** as a lubricant, This procedure worked well for most metals. Figure 3.1 Sample configuration for corrosion experiments. In the case of zinc however, Emery Paper Sheets* grades I through 0000, were used. The papers were lubricated by rubbing them with wax and applying a light coating of mineral spirits. The samples were rinsed in mineral spirits before changing to a finer grade of paper. Samples were rotated 90 0 between each grade. After polishing, the specimens were rinsed with a soapwater mixture, followed by a rinse in methanol and drying in a stream of filtered air. Finally the samples were warmed by hot air to reduce the possibility of water condensation on the surface. of molybdenum dissolved in water. Therefore these samples were rinsed in methanol only. The metal discs were positioned in a quartz tube and heated in a radiant furnace, Figure 3.2. During heating, dried** oxygen is passed over the specimens, The temperature of the sample was measured using a thermocouple inserted into a hole in the metal disc. transformer. Figure 3.3 shows a typical temperature curve. time and removed at twenty minutes. Most specimens were heated for twenty minutes. Heating less than twenty minutes resulted in temperatures which did not approach a constant level, Figure 3.3. At longer heating times the corrosion product became too thick and opaque for useful optical measurements. At the end of each heating the sample was allowed to cool in an oxygen atmosphere. part of the reacted surface. sides of the sample equally, the formation of further corrosion products can essentially be neglected. The Differential Reflectometer has been described in detail elsewhere. 8,1Thus only a brief description of the instrument and its operation is given here. difficult to make with a high degree of accuracy except for vapor deposited films in high vacuum. Surface contamination, surface preparation, variation in light source output, line voltage changes and sample alignment all contribute to error. The problems are exaggerated when an attempt is made to measure a small reflectivity difference between slightly different alloys or metals covered with thin films. A differential technique has been developed especially to make these kinds of measurements. The Differential Reflectometer is capable of detecting differences in reflectivity as small as 0.001%. approximately 2 mm diameter spot on the sample. One of the mirrors vibrates at 60 Hz and scans the spot up and down about 6 mm. The scan dimensions are adjustable by regulating the voltage to the coil of the vibrating mirror. The operator can manually shift the sample position to cause the beam to spend half of the scan time on each part of the sample. An oscilloscope trace is used to monitor the reflected intensities of each specimen half, thus allowing very accurate positioning of the sample. The reflected beam is directed onto a frosted quartz glass plate immediately in front of the photomultiplier tube to diffuse the beam evenly over the photosensitive surface. The photomultiplier output consists of a direct current component modulated by a 60 Hz square wave whose amplitude is proportional to a R. By means of a lock-in amplifier tuned to 60 Hz, the square wave is detected and a direct current signal proportional to the difference in reflectivity (A R) is produced. A low pass filter smooths the 60 Hz square wave modulation in the original signal to produce a signal proportional to the average reflectivity (T). These two signals are passed to a divider where the ratio, A R/17, is formed. the X axis of the X-Y recorder. The AR/Rf signal is applied to the Y axis. A DR spectrum is obtained by scanning the wavelengths from 200 to 800 nanometers. A typical scan takes approximately one and one-half minutes. Samples were prepared from high purity metals. The samples were polished on one surface to an optical quality, IA diamond finish. in a dried oxygen atmosphere. The corroded sample was half-polished to produce a step in the corrosion product film and the differential reflectivity between the corroded and polished areas was recorded as a function of wavelength. medium "1" be the oxide and medium "2" be the metal substrate. The light beam of the differential reflectometer is thought to scan between the two parts of this sample and thus produce the A R/N curve as described in section Ill.
A light ray which impinges upon a sample from medium "0" (r 0 ) is partly reflected (r and partly transmitted (r 2) into medium "1", Figure 4.2. The transmitted wave (r 2 ) is attenuated as it passes through medium "1" having a thickness, d. This attenuated wave is partly reflected (r4 and partly transmitted into medium "2" (r 3 ). Ray (r 4) is again attenuated by medium "1". Finally this wave reaches the 0-1 interface and is partly reflected (r6 ) and partially transmitted (r 5 Rays r 1 and r 5 are assumed to add by superposition. The internal reflection process in medium "1" continues with ever diminishing contributions from each subsequent reflection. Appendix B shows how these considerations may be taken into account. In this work however, the additional contributions are considered to be negligibly small and are therefore omitted. E = the electric field vector. equations hold, see figure 4.3. Z b =the complex impedance of medium "b"
shown at an angle for clarity only. continuity of E and H fields at an interface. The notation of media "a" and "b" has been chosen in order to emphasize the general nature of the equations. The equation for the attenuation of the electric field as the wave penetrates perpendicularly into a medium can be written according to (4-4). See Appendix A, subsection A-3. series of interactions in Figure 4.4.
begins at the upper left. At each significant point along the way, the E field is indicated. Equation (4-22) expresses the normalized difference in reflectivity in terms of the physical parameters of the model, n, n1, n2, d1 and d2 which are contained in the A's, T's and P's. not all known in advance, a difference approach is used in which the values of the unknown n s are assumed to be constant with wavelength. As solutions are achieved, the unknown dependence may be found by interpreting the difference in the calculated and the experimental reflectogram to be due to the variation of n with wavelength. Literature studies have shown that in a number of instances the complex index of refraction for a metal is nearly constant with wavelength over the range from 200 to 800 anaometers. In the case of air, 'no = 1 + i0; therefore n 0 is constant with wavelength. A digital computer was used to calculate and plot theoretical reflectograms (A R/p-R versus A ) using equations (4-12), (4-13), (4-14), (4-15), (4-17), (4-18) and (4-22). The program is listed in Appendix D. The computer was programmed to calculate A R/iR for 800 individual wavelengths between 200 and 1000 nanometers. The differential reflectograms obtained for various values of d,1L, d 2 and n1show a wide variety of curve shapes (see subsections IV-8 through IV-12). Substantial structure is observed in these graphs. As will be shown herein, the structure contains the desired information about thickness and optical properties of the film. n1 = real part of n1, the index of medium "1"
Equation (4-24) is seen to be a pure real expression consisting of a ratio of trigonometric functions of two different arguments. The first argument contains the difference in thickness and the second contains the sum of the thicknesses plus an angle P In addition the denominator contains the factor g. It is possible to understand the general behavior of equation (4-24) by analyzing the numerator and denominator and observing their individual effects upon A R/f. d 1 = 0 or d 2 = 0. The value of CP, defined by equation (4-25), will not be zero for the cases under consideration. Therefore the cosine product will not equal minus one. For the product to take on values close to minus one, the periods must be very different such that one cosine term is nearly one (or minus one) while the other periodically goes from one to minus one. This condition occurs when d is small. cos(T +2Tr'n1(d+d2)// ) rapidly varies between (4-34) +1 and -1 . Equation (4-24), when programmed, generates data that closely match the results of the original equation, (4-22) as long as the conditions of equation (A-31 of appendix A are maintained. It should be mentioned however that the exact equation (4-22) was used for all calculations and plots. Equation (4-24) is less accurate but it is much easier to conceptualize. Hence (4-24) is used primarily in rationalizing the results and in pointing the way to solutions. Line-shape analysis of the calculated differential reflectograms was employed to gain new insights into experimental differential reflectograms of the tungsten/ tungsten-oxygen system. By comparing the experimental and theoretical results it is possible to identify interband as well as interference peaks and to quantify the differential reflectometry analysis. Additionally, a number of further metal/metal-oxygen systems were investigated to demonstrate that the method is generally applicable. The possible wavelength range of the calculated differential reflectograms is from zero to infinity. The experimental range is,however, only from 200 to 800 nm. Plotting the calculated DR spectra at both a wide range and a range corresponding to the experimental reflectograms gives a more comprehensive insight into the problem at hand. Figure 4.6 shows calculated differential reflectograms (AR/f as a function of A ) for transparent dielectric films on a metal substrate. The thicknesses, d and d2f of the two transparent adjacent layers are assumed to be different, Figure 4.1. The thickness d1 varies in the three curves of Figure 4.6, whereas d2 remains small and constant. The optical constants are noted in the figure caption. The wavelength range was chosen to be from 0 to 5000 nm. The calculations were performed using equations (4-12)through (4-15) and (4-17), (4-18) and (4-22). The computer program is contained in Appendix D.
Inspection of Figure 4.6 reveals that at low photon energies (long wavelengths) the differential reflectivity is relatively constant and structureless. At high photon energies (shorter wavelengths) pronounced maxima and minima develop which have the appearance of interference type oscillations. The first maximum (moving along the horizontal axis toward higher energies) shifts to lower energies with increasing thickness, d, of the dielectric film. n= 1.6 -i 2 x 10- and A = 3-i 3. This can also be seen from equation (4-24) by setting d2 = 0. In Figure 4.7 the same specimen configuration as before was assumed; however, the wavelength range for which the differential reflectograms were calculated was taken to be between 200 and 1000 nanometers, which more closely resembles the range for the experimental reflectograms shown later in this section. Similar structure, as seen in Figure 4.6, can be observed. Again the structure is more pronounced the thicker the dielectric film, dip assumed. n1 = i2x1-6and n 2 =3 -i 3.
d mis the larger of the two thicknesses, d 1 and d 2.
geometric peaks will nor appear in the differential reflectogram is for a low n 1 x d product. So as long as the WO film is less than 16 nm thick, no interference peaks will occur in the differential reflectogram. Figure 4.7 shows the expected peak position as calculated by equation (4-44). sample configuration is shown in Figure 4.1.
be n0 = 1, n2 = 3 i 3 and k1 = 2 x 10-6. The thicknesses were dI = 20 nm and d2 = 10 nm. in which thickness d and n 1 are products in the arguments of the sine and cosine terms. IV-12 in which changes in peak shape can be seen when n 1 is varied and the difference in thickness (d I d 2) is small. di = 20nm and d 2 l=10nm. Consequently as k 1 increases, initially there is no significant effect upon the differential reflectogram. As ki1 increases, the differential reflectogram amplitudes are reduced toward zero. It now has been demonstrated that interferencetype oscillations observed in the differential reflectograms presented in Figures 4.6 4.9 are entirely caused by the geometry of the specimens as shown in Figure 4.1. The observed peaks are neither due to a change in optical properties with wavelength (dispersion) nor interband transitions. Therefore it is important to identify the conditions for which these geometric peaks can be eliminated or at least minimized in the spectral range used for experimental investigations, i. e. between 200 and 800 nm. such that the interference peaks all occur at wavelengths below 200 nm. The other is to prepare specimens so that the amplitude of the interference peaks in the spectral range is minimized. the interference peaks will all fall to shorter wavelengths than the minimum of the spectral renge, namely 200 nm. (d). It can be seen that the peak heights are reduced as the difference in thickness (d 1 d 2 ) becomes smaller. i 2 x 10-6 and n = 3 i 3. Figure 4.11 shows calculated differential reflectograms assuming the difference in thickness between two transparent films to be one nanometer (d, = 50 nm and d 2 = 49 nm). The The value of n 1 increases from curve (a) through (d). The other optical parameters are listed in the figure caption. The value of "g" was calculated from equation (4-26) and is listed on the figure. Recall that "g" is a strict function of ntn1and n 2' Thus the variation in "g" results from the variation in n 1. Figure 4.11 reveals that the interference peaks become more pronounced when "g" approaches unity. This confirms the result already discussed in subsection iv-6 stating that the peak shape and size may change when "g" is close to unity and the difference in thickness between the two oxide layers is small. The result of subsection IV-9 which shows that the peak position is dependent upon n 1 is also confirmed. thicknesses were d 1 =50 nm and d 2 = 49 nm. pronounced as shown i n Figure 4.11, curve (c). The estimate is made by comparing calculated differential reflectograms for various values of n 1 with the experimental differential reflectograms. The value of n1which yields a close match is taken to be ani estimate of n 1 in the experimental case. An example of this is presented in subsection IV-14. parameters upon calculated differential reflectograms. Equations are shown in the table. reflectograms of tungsten oxide films on a tungsten substrate. The specimens were produced by the method described in Section III and have the configuration of Figure 4.1, i. e. the thickness of the oxide on the two sample halves is different. It was observed that both sample halves of each sample show visible coloration resulting from interference effects. This verifies that some oxide is present on each half after polishing. The sample was polished to bare metal after each corrosion treatment. m F=i > E Fi 'Ci "
tungsten oxides on tungsten substrates. 4.12 was obtained by annealing tungsten at 415 00 similarly as above. A shift of the position of peak oC. to smaller photon energies is evident. With increasing annealing time the peaks are shifted further toward lower photon energies and new peaks emerge. For example, in Figure 4.12 curve (c), a pQeak appears at 325 nm and is termed peak The peak structure observed in Figure 4.12 is interpreted to be caused by interference effects resulting from the slightly absorbing film on the absorbing substrate as discussed in subsection IV-3. See Figure 4.2.